The remote weapon station (RWS) was introduced on vehicles to enhance situational awareness and defend property and personnel in high-risk areas. Sheltered inside a wall of protective armour, a gunner can engage targets without risking exposure to enemy fire. But if every vehicle is now an information platform, not just a means of transport, then the RWS also serves as one of its many data feeds. For remote weapon station manufacturers like Kongsberg Protech Systems (KPS), C4ISR might not be their primary business, but how the weapon integrates with the rest of the vehicle’s electronic architecture is increasingly part of their thinking. “More and more, our PROTECTOR RWS is acting like a sensor suite, and the lethality part of it may or may not be used. It is not just something to knock out or stop a vehicle; it has a thermal imager, a day or night camera, a laser range finder, and it can provide a lot of information about the identity of that vehicle, who is driving it, and so on,” says Cornell Pich. Pich is vice president of strategic business development for KPSC, the Canadian division of Norway’s Kongsberg Gruppen. 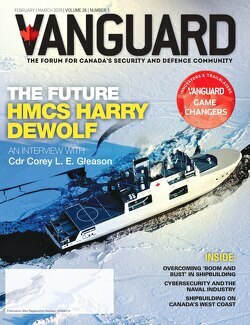 While he and the company’s general manager, Kjetil Grongstad, may be focused on maintaining current Canadian programs and developing new opportunities at home and for international markets, the challenges posed by customer demands for more intelligence, surveillance and reconnaissance (ISR) data in a networked environment are a constant reminder of what is shaping that future development. That has meant building weapon systems that are not only versatile themselves – able to operate a .50 caliber or M240 machine gun or a 45mm grenade launcher, for example – but that can also readily accept new sensor packages configured to customer needs while integrating with both new and legacy combat management suites. The responsibility to integrate a vehicle’s electronics today resides with the prime manufacturer or their C4ISR or radio system provider. But as demand for “increased capability and increased information” grows, Kongsberg is exploring new ways to disseminate information throughout the vehicle, he said. Pich invokes the image of a jigsaw puzzle to understand all the pieces that ultimately have to fit together. And since no two customers are requesting the exact same thing, that could involve some unique requirements. Although Canadian vehicles typically transmit classified data, the need to share streaming video in an unclassified form, for example, could mean a need for “multi-caveat separations of data,” he said. Over the years, Kongsberg has been at the forefront of technological advancements for RWS, including a four axis system to improve stabilization for shoot-on-the-move capability and more recent automated “slew to cue” technology. While the types of weapons available on a remote station will grow – KPS is working on a requirement to develop a FGM-148 Javelin anti-tank missile integration kit – Pich and Grongstad say meeting customer expectations, especially around information integration, poses the greatest challenge. 2014 marked the 200th anniversary for Kongsberg, predating the nationalization of Norway by two months. Although its Krag-Jørgensen bolt action rifle became the weapon of choice for the U.S. Army in 1892, the company’s physical footprint in North America is more recent, beginning in 2000 with a contract from General Dynamics Land Systems Delco for a remote weapon station on the army’s Stryker armoured combat vehicle. In conjunction with a U.S. government contract in 2006 for the Common Remotely Operated Weapon Station (CROWS), Kongsberg Defense was opened in Johnstown, PA. However, with Canadian programs such as the Light Armoured Vehicle (LAV) remote weapon station refit already underway, and the Tactical Armoured Patrol Vehicle (TAPV) program and new opportunities on the horizon, a facility in Canada was a logical next step. Kongsberg Protech Systems Canada officially opened its doors near the London airport in late 2011, though research in the area had been ongoing since late 2010. Almost within seeing distance of one of its key Canadian customers, General Dynamics Land Systems Canada, the location has allowed KPSC to service existing programs while developing new ones, including international markets. “It’s not just an offset and leave story, it is a long-term commitment to Canada and to ensure that Kongsberg will take care of these programs and then work with the government to go international,” Pich says. In fact, a tour of the shop floor in early November finds crates of newly painted Protector remote weapon stations destined for the upgraded reconnaissance LAV (also known as the LRSS), the army’s new TAPV, and even several CROWS for the U.S. Army Stryker. In addition to the LAV and TAPV – as with the vehicle itself, the remote weapon station on the TAPV underwent testing this Fall and is preparing for further evaluations in the Spring – Kongsberg is eyeing potential requirements for lighter weight remote weapon stations on other vehicle fleets as well as future navy projects for the modernized Halifax-class ships, the Joint Support Ships, and the Arctic Offshore Patrol Ships. “We are hoping to continue to expand this facility to go to a second, and potentially even a third, line in the near future,” Pich said.